BEIJING - If you have a chance to serve in the air -either as a stewardess or pilot - which would you prefer? For most men, being a handsome pilot operating a huge aircraft is likely their ideal choice, while for most women, being an elegant stewardess wearing a beautiful uniform may be their long-term dream. However, one Beijing woman booked her career path on a different flight. Twenty-nine-year-old Wang Zheng is the only female captain of Air China and the youngest one at the Civil Aviation Administration of China. "Like most girls, I also imagined being a stewardess in childhood, because it was regarded as a sign of beauty," Wang said. "But as I grew up, I thought that kind of beauty was a little bit superficial." 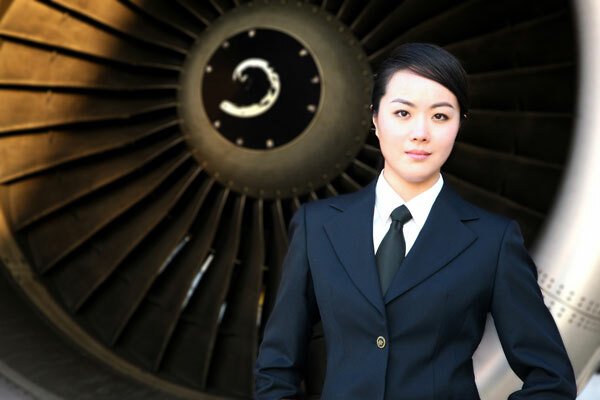 In 2003, Wang was a sophomore majoring in electronics and information science in the Civil Aviation University of China when a recruiting notice for female pilots on a bulletin board caught her eye. "I was so curious about aviation, especially flying an airplane," Wang said. "Meanwhile, many classmates encouraged me to give it a try." So Wang entered the pilot project - the first time female aviators were recruited from universities across China - and to her surprise she became one of three selected. She felt lucky because most female pilots came from the military. "But we three were college students, which sounded unbelievable," Wang said, adding that she had no knowledge of aviation at that time. Yet when Wang told her parents, her mother disagreed. "Like other girls' mums, she hoped I would do some office work, not a high-risk job," Wang recalled. "But I have always liked challenging myself." Under Wang's insistence, her parents eventually gave their consent to her decision. The project involved one year of study in China and one year of practical learning in the United States. Wang said coaches in both countries were tougher on woman students and tended to exaggerate women's faults. "Once I made a mistake during the process of checking a plane and was harshly criticized by my teacher," Wang said. Wang said the teacher wouldn't have reproached a male student that harshly for such a mistake. "Because we women pilots were a minority we stood out." But thanks to stricter requirements from the coach, Wang said she progressed quickly. "My coach once said I might be born for flying an aircraft," Wang said proudly, referring to her strong hands-on ability. In 2005, Wang joined Air China. After a series of tests such as simulated operations and flight training, she flew her first plane in October 2006. "I felt more excited than nervous the first time," Wang said, adding that the training exercises kept her calm and sober-minded. In July 2010, Wang was promoted to captain. "I once contacted colleagues working on the ground to ask for two wheelchairs. They ignored me because they never thought I, a woman, could really be a captain, " Wang shrugged as she spoke. "They had thought I simply snatched the captain's transmitter to give them an order." Wang said that compared with her male colleagues she might be not physically stronger - a big help in operating a huge and heavy airplane - but she is more detail oriented and patient. "The most important quality for a captain in fact lies in the ability to manage," Wang added. "I'm glad I proved that a woman could also do well in fields that men have always dominated." After years of work, though, Wang also admitted that it is not easy for a woman to be a captain, and she considered it burdensome work checking planes at midnight while hardly having time for family. But every time she hears another woman over the radio waves, she said she feels a stream of excitement run through her body. "I feel I am not alone anymore," she said. Wang used to dream of traveling around the world. Now, as a pilot, the dream seems much closer. "Although I fly just for work now, I will leave my footprints at every corner of the globe in the future just for fun," Wang said.